Yesterday, Re/code science reporter James Temple wrote an essay saying that he would be happy to volunteer his personal data for Google’s “Baseline Study.” The argument in favor of “citizen science” is definitely popular, but it also masks some larger, more systemic issues with health care — specifically here in the U.S. But one point did initially give me pause: The information handed over will include full genome sequences of individual participants. GINA’s health-coverage nondiscrimination protections do not extend to life insurance, disability insurance and long-term care insurance. Wow — some pretty big loopholes there. GINA’s employment provisions generally do not apply to employers with fewer than 15 employees. Okay — and how many startups/employers are there with fewer than 15 employees? For health coverage provided by a health insurer to individuals, GINA does not prohibit the health insurer from determining eligibility or premium rates for an individual based on the manifestation of a disease or disorder in that individual. Lots of big legal phrasing here that sounds like I’m the one at risk. For employment-based coverage provided by group health plans, GINA permits the overall premium rate for an employer to be increased because of the manifestation of a disease or disorder of an individual enrolled in the plan, but the manifested disease or disorder of one individual cannot be used as genetic information about other group members to further increase the premium. Gosh — I’m not an attorney, but it sounds like I need to be. 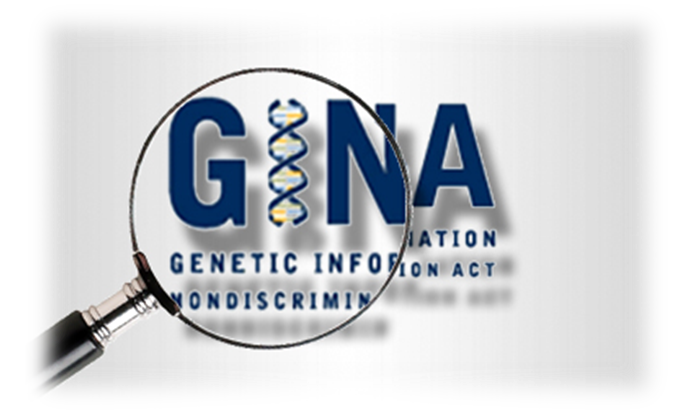 GINA does not prohibit health insurers or health plan administrators from obtaining and using genetic-test results in making health-insurance payment determinations. Okay, so just tell me — is there any legal protection under GINA at all? Perhaps the single most important element to all of this is simply the timeline. GINA was signed into law on May 21, 2008. Just over six years ago. In legal terms, that’s an unproven law (in both directions), and the greatest risk remains almost entirely mine (to prove abuse). Once my genetic data is digitized, sold, used and reused, I have little faith in this legal soup to protect my individual legal rights without incurring huge legal expenses personally. Especially as it relates to a $400 billion (market cap) company like Google. Which brings me to my second point: Health-care data trust in Google. Some would say my lack of faith in Google is overly cynical, but a little history here is warranted. Remember Google Health? The data repository that consumers could use (for free) to store their medical information? Google Health has been permanently discontinued. All data remaining in Google Health user accounts as of January 2, 2013 has been systematically destroyed, and Google is no longer able to recover any Google Health data for any user. Few will remember, but next month is the three‒year anniversary of Google’s $500 million settlement with the Department of Justice. As the briefest of backgrounders, from 2003 to 2009 the GOOG basically allowed unlicensed Canadian pharmacies to illegally advertise prescription drugs in the U.S. using Google’s AdWords program. According to the allegations, Google actively provided support and advice to the pharmacies to help maximize those campaigns which were lucrative to both the pharmacies and — of course — Google. So, what was the harm? Unlicensed pharmacies have no obligation to actually sell real drugs. For all we know, absent any regulatory consumer protection, those pharmacies were selling sugar pills in place of life‒saving medications. We’ll save the debate about U.S. pharmaceutical pricing for another day, but working outside of the regulations for something as critical as prescription drugs didn’t engender a lot of Google health-care trust for me. They paid up, of course, but that was really just Larry Page’s “Get Out of Jail Free” card. The third argument against Google is really in its own words. The company has made crystal-clear its interest (or lack thereof) in health care. This last one highlights the real interest by Google in health care. It’s vanity. You’re kidding yourself if you think that providing your genetic data (for free or paid) will have a meaningful contribution outside of the bio/life sciences community. Why do I need Google for this? I don’t — and I’d prefer to work with organizations that have an expressed commitment (even if it’s economic) to the scientific rigors of a clinical trial process. The U.S. health-care system is running at almost $4 trillion per year — an economic unit larger than Germany — consumes 18 percent of our entire GDP and is growing at about five percent per year (for as far as the eye can see — Obamacare or not). PPO coverage for an American family of four is now more than $23,000 annually. In 2012, there were 84 million Americans who either had no health insurance or were underinsured during the year. That’s effectively one‒third of the (under-65) population. In a recent study by the Commonwealth Fund, the U.S. health-care system ranked dead last compared to 10 other countries. Preventable medical errors in the U.S. are estimated at somewhere between 200,000 and 400,000 per year. Let’s take that last one. It’s a really big number — and kind of hard to grasp — but it’s effectively the same as if the world’s largest passenger airliner — the Airbus A‒380 — crashed every day, with no survivors. The worldwide uproar would have the entire fleet of A‒380’s grounded by day three. I’m absolutely sure that Google wants my genetic data — preferably for free, of course, and will say anything in order to get it. Does that mean that it has earned my trust to use that data as part of an ambiguous, long-term experiment? Not with my genetic data. At least not yet. Thanks for the offer, but no thanks.